The comfortable retreat of a hammock doesn’t have to be reserved only for your backyard. In fact, hanging a hammock indoors may be the key to relieving back pain and enjoying better health in general. Here are a few benefits of using a hammock more often. 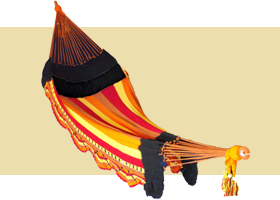 A hammock with an open weave design (like our Mayan / Mexican and Nicaraguan hammocks) is great for supporting your weight evenly and reducing pain on common pressure points. A mattress can never achieve the level of even weight support a woven hammock can because a mattress is flat while the human body is not; certain parts of your body are bound to receive more pressure while laying on the mattress. Scientists have found that the gentle back and forth rocking motion produced by a hammock alters your brain waves in such a way that you’ll fall asleep faster and enjoy longer periods of REM sleep. You’ll also achieve REM sleep more often. REM stands for Rapid Eye Movement, and is the sleep state in which you dream and your body gets its most useful, rejuvenating rest. Other studies have shown that the 10-30 degree incline position you sleep in with a hammock is the ideal position for better breathing, more oxygen flow, and optimal blood circulation. The result? It’s hard to stay sick for long or continue suffering from a bad back on a hammock. More oxygen and better blood flow combined with longer and deeper sleep with less pressure points is an all around recipe for a healthier body and mind. So what’s the key to better health and curing your bad back? Sleeping on an indoor hammock. View our complete HAMMOCK USER GUIDE: How to hang your hammock, tie hammock knots, and more. No wine or Spanish guitar necessary. Click here for six convincing reasons why you'll love sleeping in a Lazy Bandido hammock.